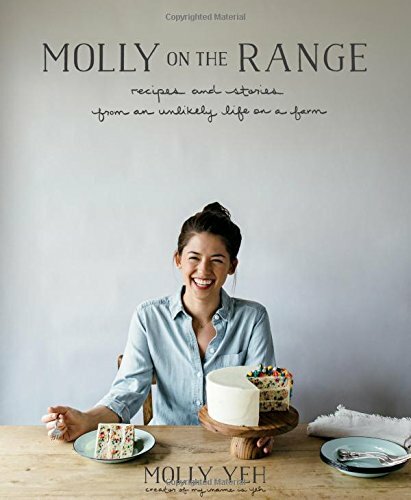 When my copy of Molly Yeh’s cookbook, Molly On The Range first came in, I flipped through it cover to cover and I didn’t really even bother marking specific pages of recipes that I wanted to make because I actually wanted to make them all. I particularly hovered over the desserts section, because I like to cook, but I LOVE to bake. Long story short, only a few days later I was commissioned to make dessert for 16 people and I could not decide between two of Molly’s cakes. So, I made both. And no one was mad about it. The first recipe that caught my eye was the Chocolate Cake with Rosemary Frosting. I did not have rosemary on hand but I did have basil, so I subbed out the rosemary in her recipe for basil for a similar effect. I love the pairing of mint or lavender with chocolate, and so this similar idea of the floral, herbal subtly paired with the bold chocolate appealed to me and it was SO AMAZING. Mr. Romansky was skeptical at first, even going as far as to call it a “salad” cake while I was making it, but after his first bite, he took back his words. By his “second” (aka third) slice, he declared it was his new favorite. This is a two layer cake, but I think it looks amazing when frosted as a naked cake, which is a nice minimal-fuss way to decorate that still gives you stunning results and presentation. And of course, if the original recipe rosemary appeals to you more than basil, give that a try instead! The second recipe I knew I had to make ASAP was the Party Trick Peanut Butter Cake. This title immediately caught my attention, because peanut butter is basically my favorite thing on earth. And party tricks are nice. Also the sentence “it’s the tastiest with the least amount of effort” is one that appeals to the heart and is a true statement. Molly says that it is so rich and peanut buttery ( It honestly tastes just like a peanut butter cookie in cake form! ) that it does not need to be frosted. And she is absolutely correct. It really does stand alone, complete in its own right. People who are not so over the top might enjoy this option for its simplicity. Buuuuuuuut, that being said, considering the name of this blog and my overall motto in life, not frosting this bad boy was never an option. So I thought about what I love to eat with peanut butter most— bananas— and whipped up a scrumptious, fluffy banana buttercream. It was a perfect pairing. This one can be served straight out of the baking dish, no decorating or cake platters or layers required. So in other words, #winning. I only made a few very small adaptations to her recipes, one being replacing the flavorless oil called for in both recipes with melted butter. In the peanut butter cake, she calls for unsweetened peanut butter, but all I had was creamy/sweetened peanut butter, so I took out just a bit of the sugar called for to counteract that sweetness. Without further ado, I give you the two first recipes I’ve enjoyed from Molly On The Range and I can assure you there are more to come. Enjoy this two-for-one, and go get yourself a copy of this cookbook! In a saucepan, melt the butter over medium heat. Add the basil leaves, reduce the heat to medium low, and simmer for 15 minutes stirring often. You don’t want the butter to brown here. Strain out the basil leaves and transfer to a metal bowl. (NOTE: This step can be done the night before, which is what I did, then placed in the fridge overnight. Then it can be softened at room temp the next morning before beating with the other frosting ingredients). If you cannot make the butter infusion the night before, you’ll want to place the bowl of hot basil butter in an ice bath and use an electric mixer to beat it it until it becomes pale and fluffy again. Once the butter is this consistency, beat in the sugar, salt, vanilla and milk. Level the cakes and frost or decorate as desired. Yummmmm-o. Note: I doubled Molly’s 8x8 inch square cake recipe and baked it in a 13x9 inch baking dish. The recipe provided below will reflect my doubled quantities and will be enough to fill a 13x9 dish (or two 8x8 square dishes or 8-in round cake pans). My frosting recipe is also enough to generously smother over the 13x9 cake or frost a two-layer 8-inch cake. *If you don't have unsweetened peanut butter, I suggest removing 2-4 tbs sugar from the recipe, especially if you will be frosting it. Preheat oven to 350 degrees Fahrenheit. Grease a 9x13 baking dish and dust lightly with flour. In a large bowl, whisk together the sugar, flour, salt, baking powder, and baking soda. In another medium bowl, whisk the egg, vanilla, buttermilk, oil, water, and peanut butter. Add the wet ingredients into the dry and stir to combine. Pour into the baking dish. Bake until a toothpick inserted into the center comes out clean, about 40-45 mins. Begin checking for doneness at 40. For the banana buttercream, beat the mashed banana and butter with an electric mixer until fluffy and almost white in color, about 2 mins. Add in the banana and vanilla extracts and salt. Beat again. Add in the powdered sugar, one cup at a time, and whip until desired consistency. Frost your cooled cake and enjoy!